Dreamwell announces its first ever academic year season, “Here I Stand.” Each of the season’s offerings features characters who choose to be who they are, despite the consequences. This season we celebrate the strength of character we can all achieve. The dramatic story of the Salem Witch trials is one of the classics of modern theatre. While there are many themes at work in this amazing play, we chose it because of the character John Proctor and his struggle to remain true to himself– will full acknowledgement of his own weaknesses–no matter what the consequences might be. This show will be directed by Scott Strode.More info here. The Curious Savage is about a recently widowed woman, Ethel Savage, whose step children don’t want her to use her inheritance for good works, so they commit her to an institution. Ethel becomes close to the unique individuals in the institution, who might just be more sane than her own step children. The Curious Savage is a comedy with a lovely message about the human spirit and choosing one’s identity. This show will be directed by Gerry Roe. A much more recent play than the fall shows, Sans Merci is about a conservative woman who reaches out to the lover of her daughter, Tracy, who died in a vicious attack. The meeting between these two very strong and different woman is intense, as they dance through their mutual grief. Each learns more about Tracy, and about her violent death. Sans Merci is about the effect one person’s definition of self can have on another human being, and what we can teach each other. Director Meg Dobbs. This laugh out loud comedy fit well with our theme about personal identity. This was actually the second show Dreamwell ever produced, and it’s high time for a revival. Baby With the Bathwater is a dark comedy about how difficult it is to be a parent, and how scary it is to be a baby and a child. The play is written in an absurdist, playful style and, for its dark topic, has a hopeful ending. This show will be directed “Artistic Director” Rachael Lindhart. Like The Crucible, Bent is the story of a man faced with the decision to live in his truth, even if it means sacrificing his own life. Max is a gay man in Nazi Germany who is sent to a concentration camp, where he finds a companion and lover, Horst. Horst demonstrates the dignity of a man who embraces who he is, even at the risk of his life. Through his example, Max must the strength to embrace his identity no matter the consequences. Director is Angie Toomsen. Once again, Dreamwell will hold a contest for Iowa playwrights. 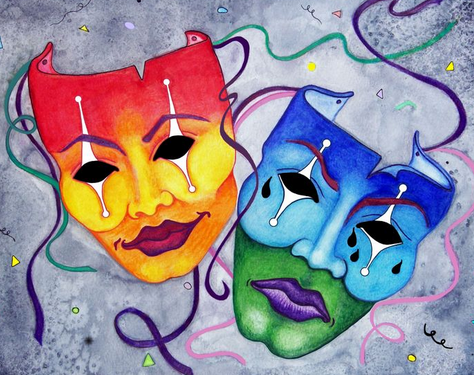 Unlike last year’s Writers Joust, which featured full length shows, this time Dreamwell is looking for one act plays that are connected to the season theme. More details about the Writer’s Skirmish.